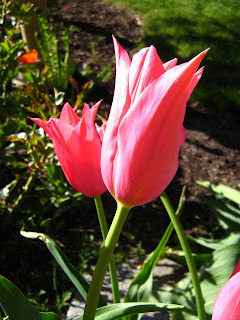 More friends and a blog: Some pretty things. I do love thrift stores, not only do I always eventually find the things we need, I usually find a few things that I just want as well. 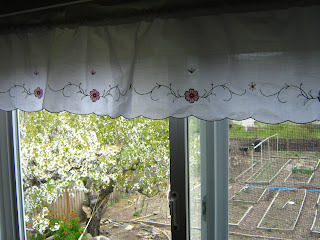 I haven't had curtains on a number of our windows for years. 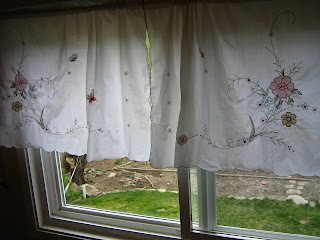 I don't mind it really, all the better for letting more light in, but when I saw these curtains priced at $3.50 for three of them, I knew that they would work well in two of the rooms in our home. These ones will go in my laundry room. And these ones will go in our kitchen when it is done. Since Samantha is kind enough to share her skirt pattern I could hardly resist buying some fabric at Sally Ann's half price fabric sale. 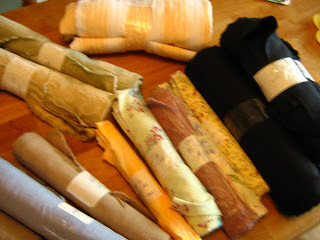 I also bought some black for a cape for E, some upholstry fabric for pillows for our couch, and linen for....well, I just can't resist linen for $1. And this, this is just too pretty not to share. Those curtains look so lovely Heather!! What wonderful thrift store finds! A very successful thrifting day for you, Heather. I share your happiness in finding such pretty things - and on sale no less!